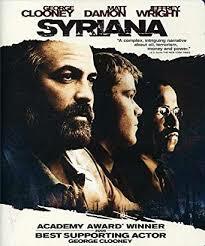 The Middle Eastern oil industry is the backdrop of this tense drama, which weaves together numerous story lines. Bennett Holiday (Jeffrey Wright) is an American lawyer in charge of facilitating a dubious merger of oil companies, while Bryan Woodman (Matt Damon), a Switzerland-based energy analyst, experiences both personal tragedy and opportunity during a visit with Arabian royalty. Meanwhile, veteran CIA agent Bob Barnes (George Clooney) uncovers an assassination plot with unsettling origins.